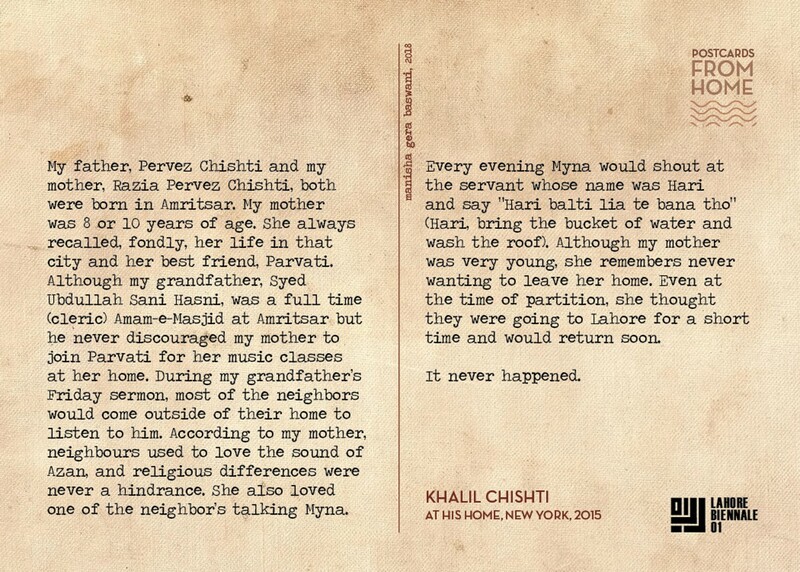 My father, Pervez Chishti and my mother, Razia Pervez Chishti, both were born in Amritsar. My mother was 8 or 10 years of age. She always recalled, fondly, her life in that city and her best friend, Parvati. Although my grandfather, Syed Ubdullah Sani Hasni, was a full time (cleric) Amam-e-Masjid at Amritsar but he never discouraged my mother to join Parvati for her music classes at her home. During my grandfather’s Friday sermon, most of the neighbors would come outside of their home to listen to him. According to my mother, neighbours used to love the sound of Azan, and religious differences were never a hindrance. She also loved one of the neighbor’s talking Myna. Every evening Myna would shout at the servant whose name was Hari and say “Hari balti lia te bana tho” (Hari, bring the bucket of water and wash the roof). Although my mother was very young, she remembers never wanting to leave her home. Even at the time of partition, she thought they were going to Lahore for a short time and would return soon.